B.O.A.T. We've all heard the jokes. Bring Over Another Thousand. A hole in the water into which you throw money. My personal favorite is: “Owning a boat in the Pacific Northwest is like standing in a cold shower ripping up $100 bills.” And pretty much every boat owner knows that B.O.A.T currency is $1,000 per unit since everything seems to sell in increments of a thousand. But the underlying truth stems from the little known but widely applied Marine Tax. What? Never heard of that one? You know about income tax, sales tax, property tax, and estate tax, but you've never heard of the marine tax? Oh you poor fool. You see, I am familiar with the Marine Tax because it is so similar to the Doctor Tax. The Doctor Tax is the premium charged for any item which is destined for a medical office simply because the purchaser is assumed to be both (1) richer than God and (2) stupid. The Marine Tax can range from 10% to 500%. Need an example? You can purchase a WiFi amplifying antenna from a good marine broadband service provider for $300. You can purchase the identical unit from a Web site for gray hat, war driving, computer hackers for $70. And anything sold at an official boating store is going to cost twice as much as the exact same item available at a hardware store, WalMart, or online book store. I think Americans in particular have forgotten how to ask this most basic of questions, but it is perhaps the first and most important. Now that I've started asking, I'm routinely surprised how frequently the answer is, “Nope.” Just as you do not need matching his and her underwear, you also do not need perfectly fitted sheets, custom curtains, or hand crafted rugs. Your fenders do NOT need to all be the same size. They don't even need to be the same color. Don Quixote supplements our fender inventory nearly every time we go out with what the girls now refer to as “driftfenders”. Note: It is not necessary to color coordinate your lines, either. Does the item look anything like something I can get at Home Depot? 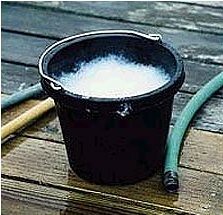 One of the more environmentally friendly and cost effective ways to clean your fiberglass boat is with a bucket, a scrub brush and a box of baking soda. I did some price shopping online and you can buy all three items at your local marine store for $28.97 or from the local hardware store for $17.15. Do I really need to explain further? Can I make the item from things I can get at Target? A corollary to the Home Depot recommendation is that sometimes you can make small changes to an item and suddenly it goes from being land based stuff to Marine Grade Product. My favorite example of this is, believe it or not, plates. Turns out that a Marine Grade Plate is a plastic plate decorated with blue anchors and includes a gasket glued to the bottom. That's a pretty clever idea – the gasket, not the anchors which I find insipid – because it keeps the plates from slipping while in use and reduces their rattling while stowed. You can purchase one of these nifty plates from your marine store for $7.99 per plate. Of course, you could instead purchase a $1.99 plastic plate, a $.99 gasket, and a bottle of rubber cement. In addition to the obvious price advantage, you also get a wider choice than blue anchors or nautical flags. Can I buy a lesser quality item multiple times instead of the marine grade item? In sweeps our Ewok flower fairies at Backyard Style, this Plastic Utility Pail costs $4.99. It's “lightweight” and “ideal for calf feeding.” Better yet, it comes in eleven bright happy colors! Just call me Calf Feeder Girl!! So with some cleverness, a bit of research, and a willingness to think outside of the boat, you too can shave dollars off sundry items essential for boating life. This month my efforts probably saved us close to $200!! 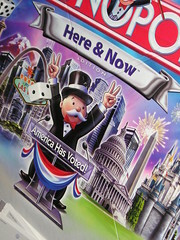 Which means in ten short months I will pay off the two B.O.A.T. dinghy Dr C bought last week at Strictly Sail. Hi Toasties or are you quixotics? My name is Mary Bennett I was browsing internet and found your blog. The author did a great job. I will subscribe to your RSS feeds. Thank you for your contribution. I am a web designer myself. And here some examples of the websites that I designed for loans online payday loans canada company.